Wolfenstein 3-D owns some great real estate in my heart, and for its 20th anniversary id Software is porting it to all browsers to play for free. 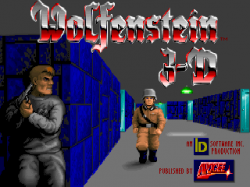 It’s a freaking party in Castle Wolfenstein, and we’re going to party like it’s 1992. I was a 9 year old drenched in Nazi blood when this was released. To put things in perspective, I had just turned 9 years old when this game was released. It was the goriest, most fantastic game my PC could handle at that time. I played hours upon hours trying to find all the secrets and dominate those gosh-darned Nazis. As an added bonus, because the gifts just keep coming, Bethesda says it will make Wolfenstein 3-D free to play on iOS as part of the massive party. Everyone’s invited. You will find me playing this online very soon.